The International Maternal, Pediatric, and Adolescent AIDS Clinical Trials (IMPAACT) Network is a global collaboration of investigators, institutions, community representatives and other partners. It is organized for the purpose of evaluating interventions to treat and prevent HIV infection and its consequences in infants, children, adolescents and pregnant/postpartum women through the conduct of high-quality clinical trials. Some areas of focus include new and existing anti-HIV drugs and formulations; novel approaches for addressing tuberculosis in HIV-infected or at-risk populations; biomedical/behavioral interventions to prevent mother-to-child HIV transmission; immunogenicity, safety and efficacy of high-priority vaccines; potential for HIV cure through therapeutic interventions; new drugs and drug combinations to treat hepatitis in HIV-infected populations, and methods to prevent and manage complications of HIV infection and its treatment. 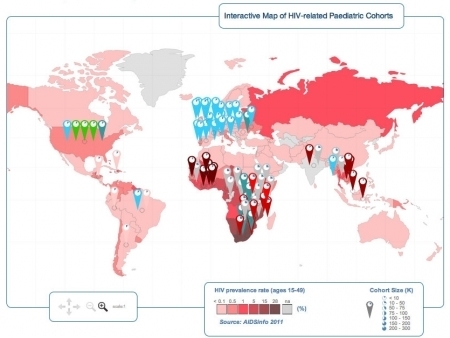 The Collaborative Initiative for Pediatric HIV Education and Research (CIPHER) is a major pediatric research initiative of the International AIDS Society (IAS). It is aimed at addressing outstanding research gaps related to clinical management and delivery of services to infants, children and adolescents affected by HIV in resource-limited settings. See the interactive map above to view the location of international cohort studies. The Office of HIV/AIDS Network Coordination (HANC) works with the HIV/AIDS clinical trials networks funded by the Division of AIDS (DAIDS) of the U.S. National Institutes of Health (NIH) with the intent of creating a more integrated, collaborative and flexible research structure. The networks are an affiliated group of national and international medical research institutions and investigators that conduct clinical HIV/AIDS research to develop safe and effective drugs, prevention strategies, and vaccines.